According to a report from the National Association of Realtors® this week, the median price of resale homes in almost 3/4 of 150 U.S. metros in 3rd Quarter 2011 compared to the same period in 2010. Click here for details. 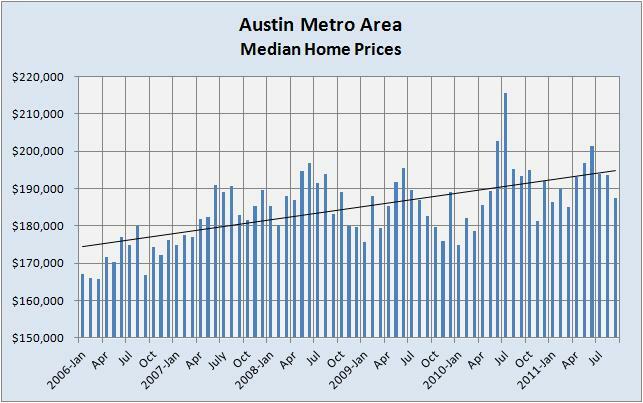 NAR’s data shows a 4.8% decline for single family homes in Austin, and a 2.1% increase for condominiums. 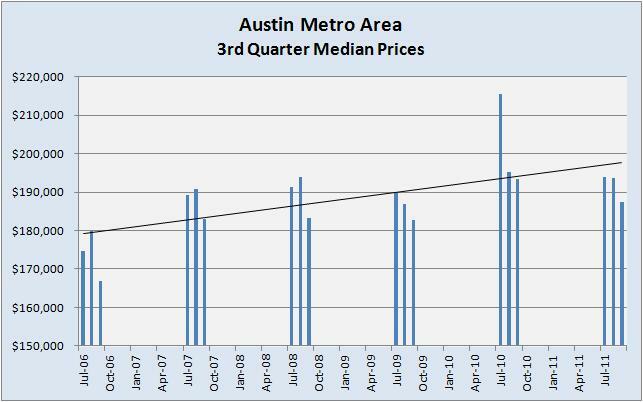 I have not tracked prices by product category in my Austin Market Dashboard, but the combined data that I do have, as reported by the Real Estate Center at Texas A&M University shows about a 1% decline overall from 3Q’10 to 3Q’11, so we’re in the right ballpark. The weakest time for home prices in the Austin/Central Texas market was 2009, and this year’s 3rd quarter median is up 3.5% from that time. Reviewing the details of NAR’s data shows that most of the cities reporting large increases in home prices this year are among those that have the farthest to go to regain their pre-recession levels. It is great to see large increases in those cities, and we must all hope this change represents a trend. On the other hand, Austin’s “slow and steady” performance during the recession means that a dip compared to last year’s very unusual July price spike should not be surprising. The longer-term view remains encouraging. More than thirty years of business experience (high tech, client service, business organization and start-up, including many years in real estate) tell me that service is the key to success and I look forward to serving you. I represent both buyers and sellers throughout the Austin metropolitan area, which means first-hand market knowledge is brought to bear on serving your needs: -- Seller Representation is a comprehensive process that begins with thorough market analysis and consultation, continues with properly staging the home to achieve the highest price possible in a reasonable time on market, a complete program of marketing and promotion, ongoing updates and communication, closing coordination, and follow-up throughout (and after) the sale. -- Buyer Representation is also full service: shopping, previewing, price and market consultation, contracting, negotiating, coordination of inspections, appraisals, repairs, and closing details, and follow-up beyond the closing of your purchase to ensure your lasting satisfaction. Because the real estate industry is becoming more sophisticated and challenging every day, you need a professional that understands the industry and is positioned to stay ahead of the game. I go the extra mile to help you achieve your goals. That's why I constantly research the market and property values so your home is priced effectively from day one. I also make sure the public knows your home is for sale by using innovative advertising and marketing techniques to attract potential buyers.